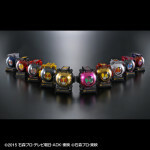 Another set of special Eyecons havegone up for pro order on Premium Bandai: we have Kamen Rider Ghost’s first entry into the Legend Rider line with a set of Legend Rider Eyecons. The first set to be avalaible will contain Eyecons representing Riders from Kuuga through Decade each one will be done up in a spiffy metallic paint job and it seems like they’ll have a personalized display stand for every one. Pre Orders will begin December 28th, 2015 and will be released in March 2016. The set will cost a rather reasonable 7,777 yen before middleman fees and shipping for collectors overseas. Do note that while pictured, the W through Drive Eyecons shown in the pre order page will not be included in this set and will be released separately at another date. Kamen Rider Ghost makes it’s first foray into Premium Bandai territory, with their first offering having just been revealed as the Ganma Ghost Eyecon three pack set! 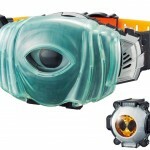 As the name suggests, this set contains three Eyecons as used by different characters in the show. 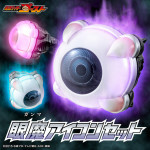 A generic Ganma Eyecon, a tinted pink Eyecon for Specter’s sister Kanon, and an eyecon for new villain Javelle! The Ganma Ghost Eyecon three pack will retail for a fairly reasonable price of 4,320 yen before middleman fees and overseas shipping to your country/state and will be released in March 2016. The 1st of the month has rolled around once more. And coming off of our collective excitement of Tamashii Nations 2015 reveals it’s time tog et back to basics. 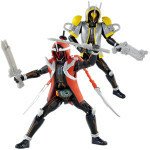 This month Bandai’s B-Boys website has updated with all of the Kamen Rider Ghost merchandise releasing for November. We’ve attached all the official images for this months products to this post but feel free to peruse the information below as well! For those eager to grab hold of the Kamen Rider Ghost opening theme, Bandai will be throwing in a nice incentive for those that buy the psychical version single by J-Rock band Kishidan. 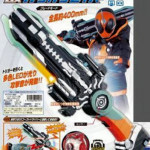 And that is a special version of the DX Ghost Ore Damashii Eyecon, which will have a different sticker and outer shell. Also included are two Ghost Ore Damashii Ganbarizing cards. The single will see release in December, retailing for 1900 yen. The weekend is fast approaching and that means it’s about time for another new form for the latest hero Kamen Rider Ghost! Premiering in the third episode will be the Robin Hood power-up which means the DX Robin Ghost Eyecon will be released! And thanks to the always diligent Wotafa on YouTube the first review is now online! Check it out below. Are you collecting the DX Ghost Eyecons? Sound off in our discussion thread! As it’s become a yearly tradition with a new Rider series and toyline, Premium Bandai unveiled this year’s holiday themed Roleplay toy: the DX Christmas Eyecon. 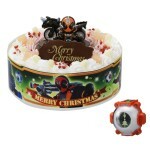 Two options are avalaible for purchase: you can buy the Eyecon on it’s own or get a bigger package which includes the DX Ghost Driver, a special Kamen Rider Ghost card for the Ganbarizing game, both will have a Christmas cake and the topper which includes a motorized figurine. The set which including the Ghost Driver will run you 13,190 yen while the Eyecon on it’s own can be bought for 4,104 yen before middleman fees (do note that international shipping laws may prohibit the cake from being shipped overseas). Either way, both sets will see release in December just in time for the holidays. The official Bandai B-Boys website has jut updated with it’s October offerings, and that means it’s time for a brand new official image dump! 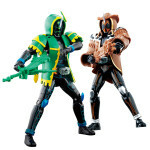 Next on our list is a series of 3 items up for release from Kamen Rider Ghost! Ghost Gadget 01 Condor Phone- Has both a phone & condor form to transform between, this item can also be used with the GanGan Saber to create Arrow Mode For Ghost Robin. Releases October 17th for 3240 yen. Ghost Change 02 Edison & Musashi Damashii Set- Includes both Damashii jackets for either form, and the corresponding version of the GanGan Saber for each. Also includes display bases to simulate the ghosts floating when not in use. You will need to already own GC01 Ghost Ore Damasjii to use these. Releases October 17th for 2700 yen. 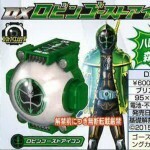 DX Robin Eyecon- Allows Ghost to become Ghost Robin and channel the powers of the legendary outlaw Robin Hood. Compatible with the DX Ghost Driver & GanGan Saber this Eyecon also includes a Ganbarzing Ghost Robin Card! This item release on October 17th for 648 yen. With the premiere of Kamen Rider Ghost just around the corner, commercials for it’s toy line are beginning to surface via Bandai’s official Youtube channel. In this particular one, we’re given a quick look at just how the DX GanGan Saber will function, both on it’s own and with the DX Ghost Driver. The DX GanGan Saber will be released later in October, we’ll be posting more updates as they become avalaible. 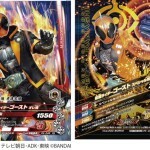 DX Ghost Driver Hacked, New Eyecons/Damashiis Revealed! 1st off there are major spoilers with this, but it seems a Japanese fan has hacked a store display DX Ghost Driver from Kamen Rider Ghost. Purportedly this individual did so with Q-Tips but that’s speculative right now. However thanks to a set of sound clips circulating thanks to this individual we can fully confirm the validity of the below list of bran new Eyecon sounds for the DX Ghost Driver related to new Damashiis. For anyone wishing to here these sound clips we’ve attached the hacked MP3’s to this post. Credit for finding this set of files actually goes to TokuNation user ElConvoy, so thanks for that! All other information is courtesy of The Ghouly News!